William Thomas Howell Allchin was born in Queen Street, Oxford in 1843 and baptised at St Peter-le-Bailey Church on 17 August that year. He was the second son of Francis Alfred Allchin and Mary Ann Griffith Howell, who were married at St Mary Magdalen Church on 21 February 1841, and were both then living in that parish: his father was the son of Thomas Allchin, and his mother was the daughter of John Griffith Howell. On 26 December 1841 William’s parents had their eldest son Charles Alfred Howell Allchin baptised at St Peter-le-Bailey Church: they were already living in Queen Street, where his father had set up business as a wine & spirit merchant. William was their second child, born in 1843, and his next brother Robert Howell Allchin was born in Oxford in 1845. The family moved to the St Pancras area of London soon after Robert’s birth. Robert died there the following year at the age of one. Another brother, Frederick Howell Allchin, was born in Shoreditch in 1849/50. The 1851 census shows William’s father Francis (37) working as a commercial clerk and living at 2 Emmerson Place, Southwark with his wife Mary (30) and their children Charles (9), William (7), and Frederick (1). Within a month or two of the census, William’s father had died. William probably went to school in Oxford, and may well have had a choral scholarship. At the time of the 1861 census, when he was 17, he was living at 21 Beaumont Street with his uncle and aunt, Robert and Emma Marshall. Mrs Marshall was a schoolmistress. and two assistants, one a teacher of French, lived in the household. His brother Charles was then lodging in London, where he worked as an assistant clockmaker. His other brother Frederick Howell Allchin also appears to have returned to the Oxford area, where he died at the age of 13 in 1863 (reg. Headington district third quarter). William was matriculated at the University of Oxford from New College on 4 June 1869, at the age of 24, and obtained his Mus.Bac. degree on 10 June 1869. At the time of the 1871 census, when he was 27, he was living completely on his own (without servants) at 6 Park Road, Oxford (which was then called Parks Street), and was described as a professor (teacher) of music. Sarah Tame was born at 7 Beaumont Buildings, Oxford in 1834 and baptised at St Mary Magdalen Church on 20 April. She was the daughter of Thomas Tame (born in Faringdon, Berkshire in 1804/5) and his wife Mary (born in Worthen, Shropshire in 1801/2). Sarah’s father was a college servant at the time of her baptism. In 1851 Sarah (17) spent census night at 7 Beaumont Buildings with her parents and her younger brothers John (15) and Thomas (13). Her father was still a college servant, and Gardner’s Directory of 1852 directory reveals that he worked for Trinity College. Her brother John died the following year at the age of 17 and was buried on 28 June 1852, probably at St Mary Magdalen Church. 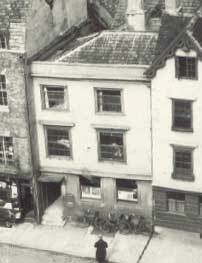 By 1861 Sarah’s parents had moved to 47 Broad Street, and her father was still described as a college servant in the census, but it is likely that he had also set up a wine & spirit business at that address with the help of his son Thomas Tame junior (22), whose occupation is given as “assistant”. Both of her parents died at 47 Broad Street in 1865: her mother Mary at the age of 64 (buried 4 May) and her father Thomas at the age of 58 (buried 21 July). At the time of the 1871 Sarah’s brother Thomas Tame junior (32) was the wine & spirit merchant at 47 Broad Street, and Sarah, an unmarried annuitant of 36, was living with him and his wife and young son. A birth announcement for the twins was placed in Jackson’s Oxford Journal. William and Sarah Allchin evidently began their married life in William’s earlier home at 6 Parks Road, but in 1875 they moved into the house of Sarah’s parents and latterly her brother at 47 Broad Street (right). This house in St Mary Magdalen parish was on the extreme left of the group of thirteen houses dating from the first half of the seventeenth century that was demolished to make way for the New Bodleian Library in the late 1930s. At the time of the 1881 census William and Sarah were living here with their four children Gerald (8), Mabel (6), and twins Gwladys and Basil (2), plus a governess, nursemaid, and general servant. † William Thomas Howell Allchin died at 47 Broad Street at the age of 39 on 8 January 1883 and was buried at St Sepulchre’s Cemetery on 12 January (burial recorded in the parish register of St Mary Magdalen Church). His personal estate came to £865, and his executors were his wife and the Oxford printseller Edwin Alder Ryman Hall. At the time of the 1891 census Sarah Allchin, a widow of 55, was living on her own means at 47 Broad Street with her daughter Gwladys (12), plus a lodger and a general servant. Her other daughter Mabel (16) was a pupil teacher at the London Orphan Asylum in Watford, and her son Basil (12) was boarding at Christ’s Hospital School in London. Her eldest son Gerald (18) is hard to find in this and the following census, and may have been abroad. In the mid-1890s her son Basil Charles Allchin studied at the University of Oxford as a non-collegiate student, obtaining his B.A. in 1898. In 1901 Mabel (26) who on census night was home with her mother in Broad Street, plus one servant. Her twin siblings, who were now aged 22, were both staying with their uncle Charles Allchin (whose wife Jane had died on 5 January 1900) at 27 Bromfelde Road, Clapham: Basil was a church organist, and Gwladys a shorthand typist. In the second quarter of 1907 at St Augustine’s, Broxbourne, Hertfordshire, Basil Charles Allchin (who was then living in Oxford, as banns were called in St Mary Magdalen Church) married Mary Robinson. † Gerald Alfred Allchin died in 1910 at the age of 28, probably abroad, and he is mentioned on the family grave. In 1911 their two unmarried daughters were living with their widowed mother at 47 Broad Street: Mabel (36) was a teacher of music, and Gwladys (32) was secretary to the Professor of Rural Economy. Meanwhile Basil (32), a teacher of music, and his wife Mary (27) were still living in Oxford, at 15 Beaumont Street. 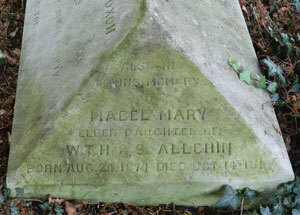 † Miss Mabel Mary Allchin died at the Radcliffe Infirmary at the age of 43 on 14 October 1917 and was buried at St Sepulchre’s Cemetery on 17 October (burial recorded in the parish register of St Mary Magdalen Church). Her effects came to £770. † Mrs Sarah Allchin née Tame died at 47 Broad Street at the age of 92 in January 1927 and was buried at St Sepulchre’s Cemetery on 2 February (burial recorded in the parish register of St Mary Magdalen Church). Her effects came to £2,124, two-and-a-half times the amount left by her husband. Basil Charles Allchin (born 1878) and his first wife Mary do not appear to have had any children. He was the Assistant Organist at Christ Church, Oxford and Organist at Hertford College, and he also taught music at Exeter College, Oxford in the 1920s. In 1935 he and Mary were living at 18 Turl Street, Oxford. Basil taught at the Royal College of Music from 1920 to 1947, and was its Registrar from 1935 to 1929. Mary appears to have died in 1946, and in 1947 Basil married his second wife, Margaret Joyce Davis. He died at Wells, Somerset near the beginning of 1957: at the age of 78. His effects came to £3,712 0s. 3d. Gwladys Marguerite Allchin (born 1876) never married. She inherited the family home at 47 Broad Street on the death of her mother in 1927, but two years later it was demolished to make way for the New Bodleian Library. She died in Oxford in 1972 at the age of 96 (age wrongly recorded as 94).